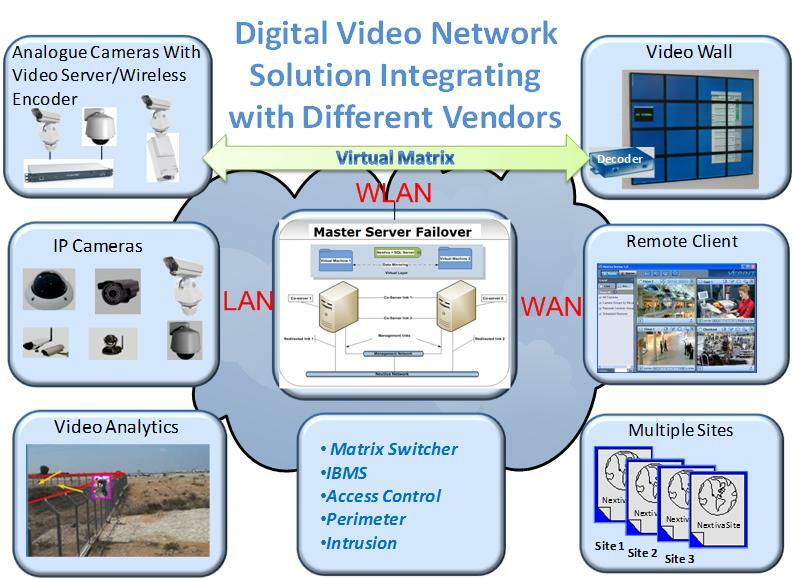 The video management software solutions, open and distributed architecture, is able to support IP cameras such as Axis, Sony, Acti, JVC, encoders and decoders from Smartsight, VCS, Maxis, Impath, and analog video matrix switcher, video wall and digital video recorder from Pelco, Amercian Dynamics, Panasonics, Cornet, Extron, GE, Avitech, Barco, etc. IPEnterprise develops customized solutions for targeted vertical markets including access control, POS, building management and other physical security systems, and easily integrate devices onto the platform. Our solution also includes wireless video server which is the industry's first wireless Ethernet (802.11) video system that delivers high quality MPEG4 video at 30 frames per second over local area networks (LANs). The encoder can be extended over Local and Wide Area Networks (LANs and WANs) or the Internet using ISDN, PSTN, or xDSL routers. These Ethernet video servers are built on open standards and are entirely firmware upgradeable to provide long-term investment protection.